Click thumbnail image to enlarge. Annotations, where available, are denoted by the blue links in the transcriptions. 1 January 1-3, 1863 Emilie celebrates the Emancipation Proclamation. 17 February 18-20, 1863 Emilie celebrates her 24th birthday. 26 March 17-19, 1863 Emilie attends a lecture by Frederick Douglass. 39 April 25-27, 1863 Emilie attends another lecture by Frederick Douglass. 60 June 27-29, 1863 Emilie sees refugees, fleeing Confederate forces, pour into Philadelphia. 61 June 30- July 2, 1863 Emilie anticipates a Confederate advance on Philadelphia. 63 July 6-8, 1863 Emilie celebrates the Union victory at Vicksburg. 113 December 3-5, 1863 Emilie hears Frederick Douglass deliver a keynote address. 145 February 18-20, 1864 Emilie celebrates her 25th birthday. 233 November 8-10, 1864 Emilie predicts that President Lincoln will win reelection. 273 February 18-20, 1865 Emilie celebrates her 26th birthday. 287 April 1-3, 1865 Emilie learns of the fall of the Confederate capital, Richmond. 291 April 13-15, 1865 Emilie learns of the assassination of President Lincoln. Website and Transcriptions © 2012 Villanova University. All Rights Reserved. 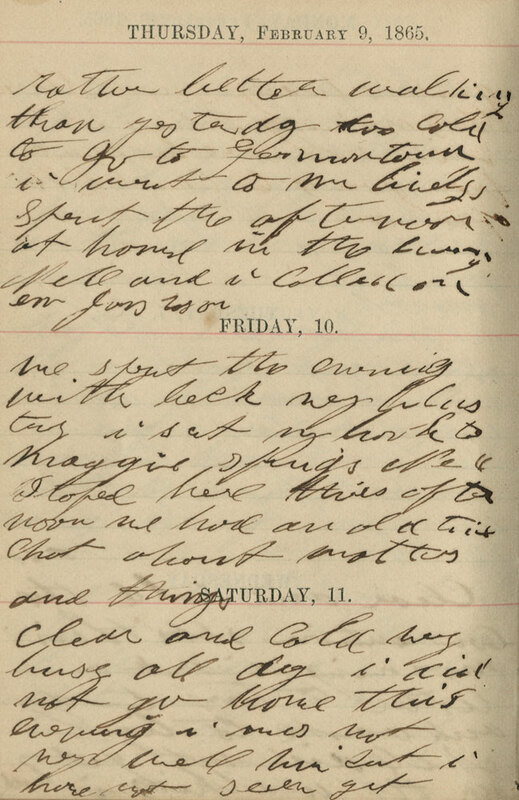 Images of the Emilie Davis Diaries are property of the Historical Society of Pennsylvania and are used with permission for research purposes only. Unauthorized copying or reproduction is prohibited. For further access to the diary, please contact Rights and Reproductions at HSP.